Whenever Opera Chic sees a conductor go crazy on the podium, flailing his arms around like a windmill in a desperate search for that elusive note, beating the tempo like a heavy metal drummer, she thinks of Lorin Maazel and his priceless style. The economy of his gesture, his gesto direttoriale, really brings her back to a different era. Now, one can take issue with some of his performances, obviously, even it's kind of too easy to repeat the usual (lazy, sorry!) cliché of Maazel as high-class hack, a globe-trotting old master who more or less phones in his performances -- because frankly from what she hears on the radio and on TV and through teh internets, a good 90 percent of people put in charge of orchestras nowadays would be well served by watching a few DVDs of Maazel in the quiet of their home and just, you know, pay attention to all the things that Maazel knows and they don't. That, and the fluent beauty of Maazel's spotless Italian -- how can he master those crazily irregular verbs so seamlessly, dang him! -- are among the reasons why Opera Chic keeps Maestro Maazel in a very cozy place in her BEST CONDUCTORS LIKE EVAR hall of fame. Having said that, this morning, while having a healthy breakfast of Gilli composta di mirtilli rossi, a freshly baked muffin (yes you can find them here if you look hard enough) and a decent caffè Illy, Opera Chic could not avoid to wonder, who put sand in the great maestro's underpants? (I carry Brahms in my heart) but also Britten, Sibelius. And Bernstein to whom I'll soon dedicate a concert. 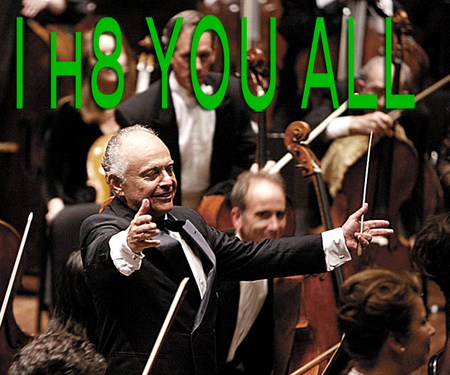 When he was the director of the NY Philharmonic, critics attacked him in a shameful manner, asking him to resign. But American critics are ignorant. If they wrote about sports they'd have gotten fired a thousand times already, but classical music is a niche field and the newspaper editors don't know anything about music anyway. Great music, music beloved by all, that's what critics hate the most: mediocrities cannot stand those who are talented. Puccini, Bizet, Tchaikovsky get panned while some 20th century composers who are impossible to listen to get all the praise. Even a hardliner like Maderna, close to death, realised that the only opera he really wanted to conduct was Don Giovanni". No, maestro, please, don't be so diplomatic: tell us what you really think.